NBA Jam did for Baskestball, what Happy Gilmore did for golf, minus the deliberately obnoxious twattishness of “GET IN THE HOLE”. So, the game. Is it any good, or did it just spawn several catchphrases? Well, it contains all the NBA franchises from the era, and the two “best” players form each team. Subsequent versions would have 3/4 players who you could sub in. First of all, this game has demonstrated to me what went wrong with the FIFA series. It is just fun. There is no attempt at realism, you can literally do a 1080 summersault, while on fire, jumping 20 feet in the air, before dunking it, burning the net off, AND smashing the backboard of the net. This lack of realism, and focus on FUN means the game lasts, and is still enjoyable. FIFA, as an example, is the same game you have played for the last 20 years. The only reason you buy a new one is an updated roster. As surely, NOBODY wants to see an ultra hi resolution image of Wayne Rooney’s FUGLY mug. I have been playing on my own, for the last week and started to notice it, so yesterday (25th August) I had a mate round, and we played a good 20 matches, and after a while he started to notice. The game really screws you at times. If you are winning by more than 6 points, the computer just goes insane. Seriously, you go 6 points ahead, they’ll start sinking 3 pointers from their own D. They’ll be able to steal the ball off you if your’re remotely close to them, and those simple dunks will start miraculously missing. 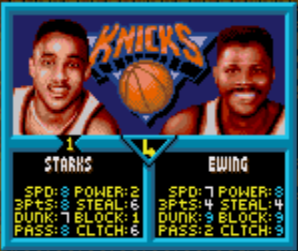 We played as New York Knicks, I was Patrick Ewing, he has 100% stat for dunks (SNES version), once you go 6 point s ahead, he suddenly lost the ability to dunk. It is strange. 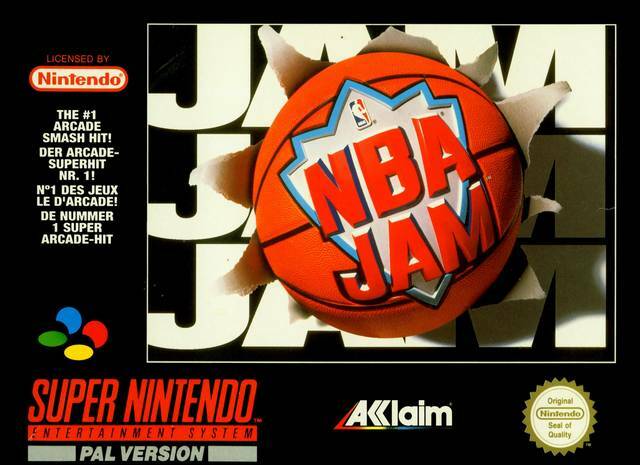 It is the NBA Jam equivalent of the BLUE TURTLE SHELL. We would often go from 10 point lead at the end of a quarter, to 2 behind within a minute or two. After a while, we just settled on backwards and forwards, keeping it level, then time wasting the last minute/30 seconds, and dunking it at the buzzer to win by 2 points. When the score is like this, expect Dallas to go insane! So while it is a good, and crucially fun game, it does start to grate playing the AI, when you have to just sit back and keep it level. 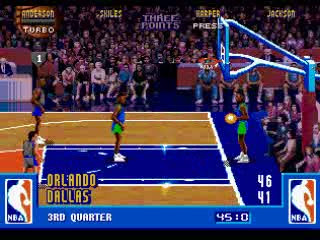 It has been reveled (Huffington Post), that NBA Jam contained code that, if Chicago Bulls were playing Detroit Pistons, Chicago would miss late chances to try and force you to lose. For the initial release, some NBA players (Micheal Jordan) refused to allow their likeness to appear in the game. So early versions of the Arcade and SNES version were missing some players. Once the game became the huge success it was, these players came crawling to Midway and were subsequently included in later versions. Like other Midway games (Mortal Kombat) digitised characters were used. This meant the players actually vaguely resembled their real-life counterpart. The animations were done by using digitised video footage of several amatuer basketball players, so looks and feels fairly realistic (dunks excluded). The crowd animation is non existent, this isn’t uncommon for a 16bit generation game, but I do feel as though they could have done something with the crowd. 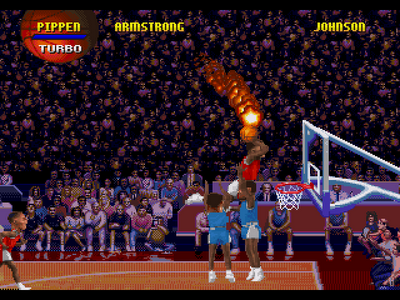 NBA Jam manages to do what FIFA never did, they made it inherently fun. They stripped the game back to the essence and focussed on the joy of playing a game. You don’t need to like Basketball to enjoy this game, there are no NBA rules to get your head around (only goal tending), so it is immediately accessible, and doesn’t require much mastering. Making pick up and play immensly fun. My mate beat me in his first game playing it in 20 years! Finally, the game does feel a little unfair at times, so while it is a good game, it does have some pretty significant flaws. Pros: Simple, fun to play, catchphrases rule! Makes for one Hell of an addictive (and somewhat frustrating) game though when you are hungover on a bank holiday.